This post is about…uh…wait a minute, it’ll come to me…I had it right on the tip of my…oh, yeah - how to survive those times when you can’t remember where you left something or where you intended to go or when you last ate something. No, this post isn’t about the symptoms of Alzheimer’s Disease. 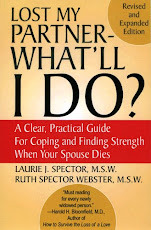 It’s about some of the normal symptoms that occur if your spouse/partner has recently died. Whether it’s misplacing your keys. Or suddenly realizing you’ve driven to some place you never intended to go. Being forgetful, absentminded and disoriented are common reactions to the intensity of experiencing a major loss. Even with an expected loss, there’s always some shock to your system, because nobody can really predict how they’ll be affected by a death. With most deaths, especially unexpected ones, your whole world is often thrown into chaos. In addition to the assault on your thoughts and emotions, there’s also the disruptions in your usual sleeping and eating habits as well as your ability to concentrate. Try not to panic. Assure yourself and others that memory and concentration problems are temporary symptoms of having lost your partner. In our next post, we’ll offer some practical techniques for surviving this period. Thank you so much for this timely post. I've lost two loved ones from my immediate family in the last twelve months. Absentmindedness is one of the most frustrating things about my grief. It's difficult enough to face some of the tasks that I must accomplish, whether it's talking to the attorney or doing the dishes alone, but the time I spend retracing my steps to find things, remember things, etc., seems enormous. I have to remind myself to be extra attentive when I'm driving because I'm afraid of not noticing hazards until it's too late. I'm 54, otherwise healthy and have a good driving record. You've really illustrated how unsettling it can be when these symptoms of grief affect otherwise normal activities.